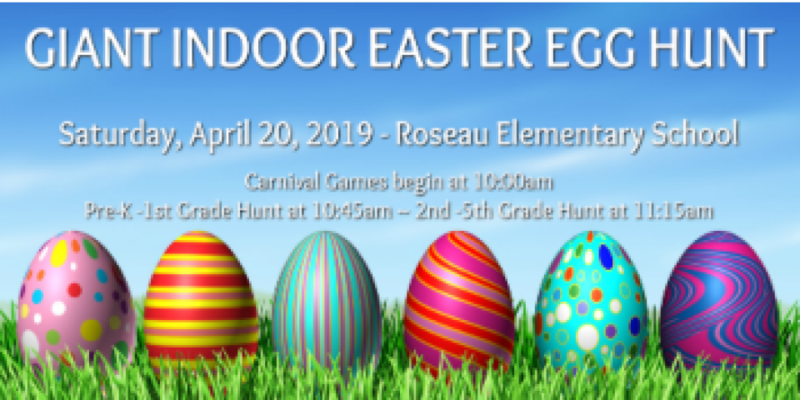 RECC is hosting its third Annual Giant Indoor Easter Egg Hunt for families in our community on Saturday, April 20, at the Roseau Community Schools. Doors open at 10:00am. Enjoy FREE carnival games, FREE balloon animals, FREE face painting, FREE pictures with the Easter Bunny, FREE crafts and FREE snacks in the cafeteria beginning at 10:00am! The Pre-K through 1st Grade Hunt will take place in the High School Gym at 10:45am. Children may start lining up in the High School Gym at 10:30am. The 2nd through 5th grade hunt will take place in the Elementary School Gym at 11:15am. Children may start lining up in the Elementary Gym at 11:00am. For more information, call 218.463.3420.